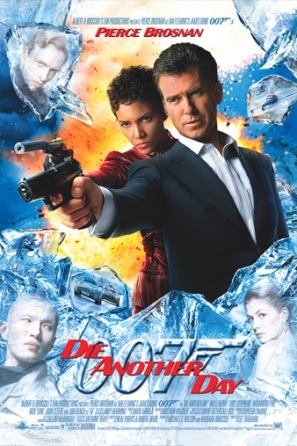 Die Another Day starts out with one hell of a gutsy a move – Bond being captured, and then tortured and imprisoned for fourteen months was an extremely brave decision to make, and it really works for me. It’s a shame though that the filmmakers couldn’t have run with this idea and have tapped into some emotional and mental challenges unlike ones which Bond, particularly Brosnan’s Bond, had ever faced before. And although any trauma that he may have had is fixed with a quick haircut and shave, to a degree they do keep this interesting angle going for a while by having him working outside of MI6 for the first hour, but that then also peters out and we are left with a rather empty, and lifeless film. Q’s room full of old gadgets is a great way of celebrating Bond’s 40th anniversary, but when the references then start leaking out of there and becoming plot points, it stops feeling fun and becomes more like a terribly lazy rehash. Having said that there are a couple of moments of innovation, such as the twist on the gun barrel sequence which I actually quite like; sure it’s a little gimmicky having a bullet fly toward the camera but it’s not such a bad way of mixing the sequence up, is it as good as Casino Royale’s attempt – no, but it sure is better than Quantum of Solace’s, which removed it from the opening altogether, only to then meaninglessly stick it in at the end of the film instead. I also really like how the credit sequence is developed into a device that furthers the story, rather than just being a series of pleasant images. I’m aware that seeing Bond being tortured whilst naked silhouettes glide around the screen is strongly offensive to some fans, but I fully support it, it’s one the few original things in this entire film. Gustav Graves is just a really boring, uninspired villain – and what’s with all this modelling himself on Bond that he goes on about at one point? I guess it’s OK if the character believes this, but without anything backing his claim up it doesn’t interest us, especially so as the darker version of Bond has already been explored and pulled off excellently by Sean Bean only three films previously. As to the other villains; Zao is fairly average, and the addition of a diamond scattered face doesn’t make him any more interesting, Mr Kill is just there for his name to demonstrate how unimaginative this film really is, but Miranda Frost is a little different. I’m always a fan of Rosamund Pike, and here she holds up admirably against both Judi Dench and Brosnan in what was her first feature film role. She would have made a better villain than Graves had she been put centre stage, but I also think that she could have been a great one if given a lot more to work with, and a layer of depth beyond that she loves fencing to the level that she will betray her country for it. The first half of the film actually had me pretty engaged; the relatively sparse action was balanced nicely with the unusual character arc, or at least suggestion of such an arc. In fact I’m going to say that based on the first hour alone, I would have predicted that this would be Brosnan’s second best film after Goldeneye, and possibly one of the best in the series. But then comes along the simulation training and invisible car, which immediately knocks the film significantly lower down on my ratings, and it becomes obvious at this point that the depth that the film had flirted with is now completely gone, and that it won’t ever return. There are of course many elements that harm Die Another Day that I haven’t mentioned; the painfully brash Matrix influences, the overreliance on bad CGI, the god-awful end credits which make the title track sound like Goldfinger, and the fact that we are given another badly characterised action Bond girl in the form of Jinx. It’s such a shame that this film is so colossally let down by its later half; it had so much promise and could have been a brilliant mixture between celebrating the past and developing the franchise into the future. As it is Skyfall already has the advantage of a modern reinvented Bond, but let’s just hope that it manages to recognise the past successfully, without becoming trapped in it and mutating into a parody of itself. Agrees: The first half of the movie is fairly decent. Gustav Graves is one of the worst villains ever. Jinx is supposed to be “Bond Action Girl” but it doesnt come across that way when she needs rescuing constantly. Shoehorning in all the references to the old films got tired with the exception of Q’s lab. Disgrees: I think Zao is actually a pretty good villain, I like how we get to see his origin story. LOL. Looks like the “Agrees” far outweigh the “Disagrees” Rumsey! I just think that he could have been made far more interesting if he say, took up a more prominent vendetta against Bond for killing his superior and blasting his face full of diamonds. He just feels underdeveloped to me considering we see part of his origins.